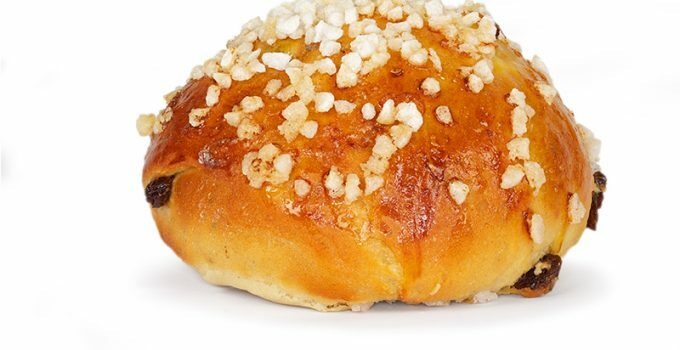 The Bath Bun is a sweet roll bun with sugar on the top, a speciality of the city of Bath. It is made from a milk-based yeast dough. Bath Buns seem to have appeared in the eighteenth century. On the one hand it is said to have originated with a French Huguenot refugee, Solange Luyon, who would have introduced the baker she worked for to the French style egg-and-butter bread, resulting in a type of bun called Sally Lunn, actually different from the Bath Bun but originating the bun baking tradition of that city. The recipe of the Sally Lunn buns was lost, then rediscovered around 1930. Nowadays there is a clear difference between the so-called Sally Lunn buns and Bath buns, the latter being sweeter and smaller. Another story tells that a physician named William Oliver used to treat patients visiting the city’s Roman baths and offer them the buns that he had invented. He also invented the Bath Oliver, a sort of dry cracker. These stories seem to be legends but what is sure is that Bath buns have been, since the eighteenth century, a very popular type of yeast-leavened rich bread. In a letter of 1801, Jane Austen, who lived in the city of Bath for a while, mentions how she could be ‘disordering (her) stomach with Bath buns’. To prepare the traditional Bath Bun, eggs and butter were used. Next, caraway seeds were added and then coated in several layers of sugar. Unfortunately, the Great Exhibition of 1851 appeared to have been a defining moment for Bath Buns. The catering contractors started to produce circular buns with lower quality. The caraway seeds were omitted and lard was substituted for butter. Nowadays, in the town of Bath, buns made from an old recipe are still available in a few bakeries. Bath Buns can be served for breakfast as well as for afternoon tea.